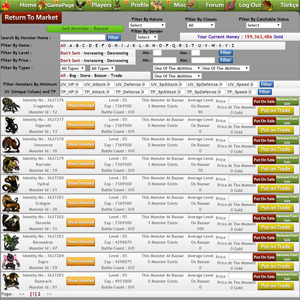 Some of our core features are fully working live PVP battles, NPC trainers, Arenas, Individual values, Training Points, 2,000+ Monsters, 520 game maps, very fluent gameplay, extreme cheat prevention system, market system that supports buy, sell, trade, game integrated chat system, working private message system... 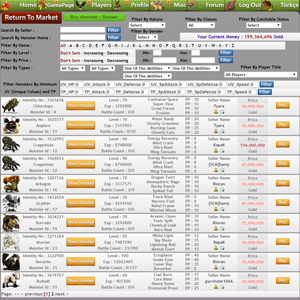 Please check below for all of the features! 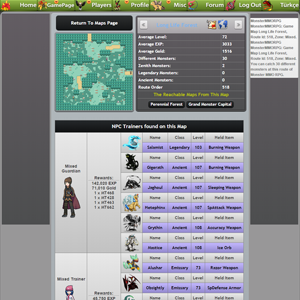 Monster MMORPG has an advanced navigation system that is also easy to use. You can use either the w/a/s/d keys or the arrow keys on the keyboard to move north, west, south, or east. The button(s) can be held for continuous movement. 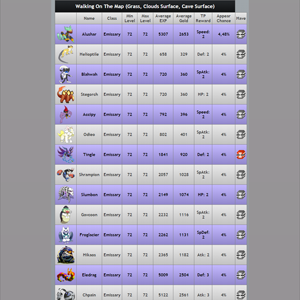 You can also click on the navigation arrows on the right side of the screen to move. 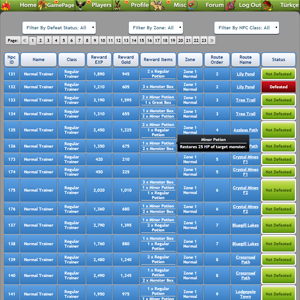 There is a multi-step feature built into the navigation arrow; simply enter a number into the center box to move that number of steps with every 1 click. While walking through areas with tall grass, you will encounter wild monsters. 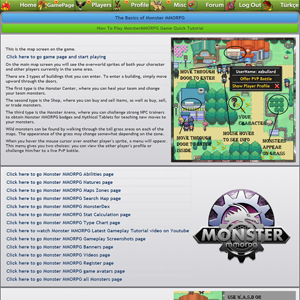 The monster's picture as well as its Monster ID, name, and level will appear on the upper right. 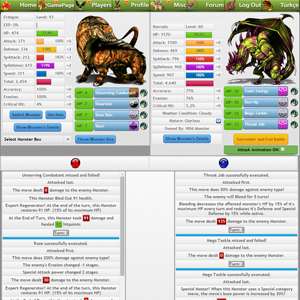 Individual monster properties which will become very important to aspiring battlers, such as IV values, the monster's nature, and inherent abilities, are assigned when you enter the battle and can be viewed in the battle window. 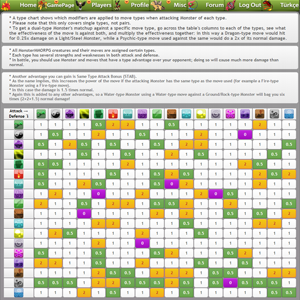 Individual values, or IVs, function in a similar way to Pokemon's UV value system, but somewhat more advanced. When you encounter a wild monster, you have two choices: battle it or run away. In order to successfully escape, at least one monster in your team must be faster than the wild monster. However, not all battles can be escaped. Sometimes you just have to fight! 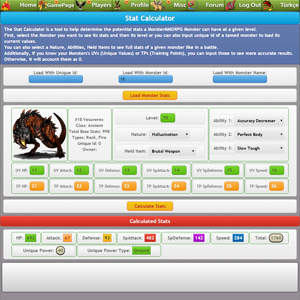 Hovering your mouse cursor over the wild monster's image will display the monster's class, total base stats, and type(s). 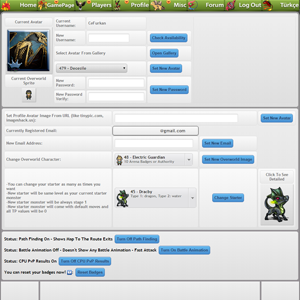 Clicking on the blue Monster Dex icon in the lower right corner of the battle window will open the wild monster's entry in the Monster Dex. 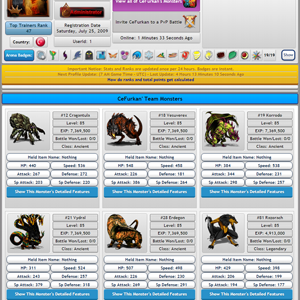 The Monster Dex contains all information about the wild monster, including default abilities, ability pool, type effectiveness, the monster's artist, and so on. 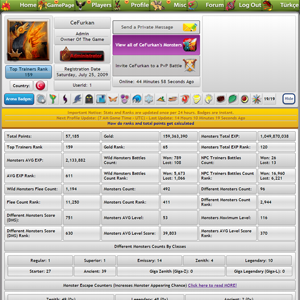 This is the quick tools box on the main game screen. 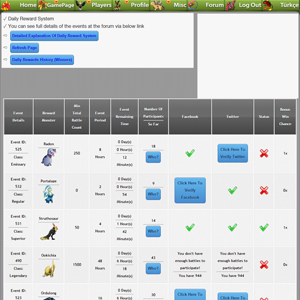 The first three boxes are for using Nets (Regular Net, Quality Net, and Perfect Net) to engage in battles with water-type monsters. These nets are permanent items; you need only buy one of each type from the Shop, and after doing so they can be used an unlimited amount of times. To use a Net, simply stand at the edge of a water area and click on the button for the type of Net you wish to use. You may need to use the Net several times before a monster appears. 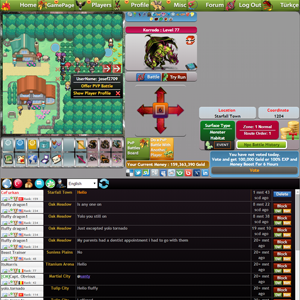 Clicking on the bag icon will display your Items page. 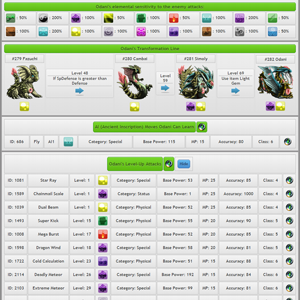 In your Items page, you can use items in your inventory to heal your monsters, increase or decrease their training point (TP) values, or to transform a monster into its next form. 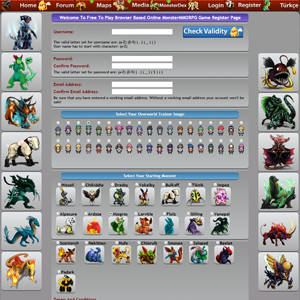 Clicking on the mini-monsters icon will take you to your monster team page. 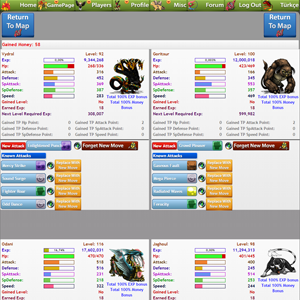 Your monster team page displays the six monsters currently in your party. 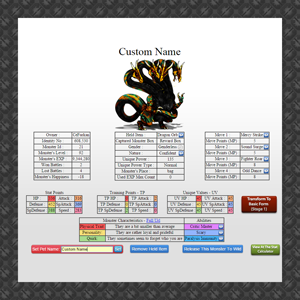 You can view their details from this screen, transform them into their next forms (provided the requirements are met), or release a monster back into the wild. Note: releasing a monster is permanent. 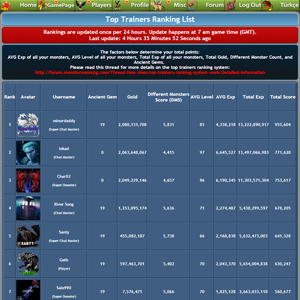 You will NOT be able to recover released monsters, so be careful. 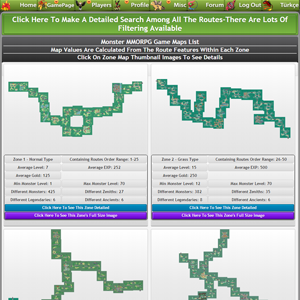 Clicking on the mini-map icon opens the details page for the map route you are currently in. 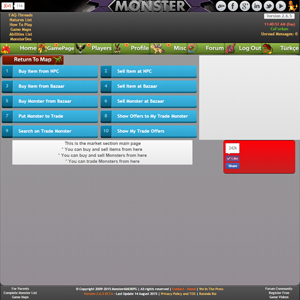 The map details page is a valuable resource where you can see all the available monsters that can appear in the current area, as well as their names, minimum and maximum levels, average EXP and gold per fight, the amount and type of TP the monster grants upon defeat, and the chance a particular monster will appear. 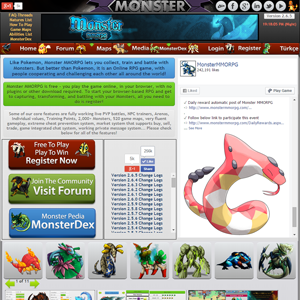 Clicking on the blue Monster Dex icon will open the Monster Dex main page. 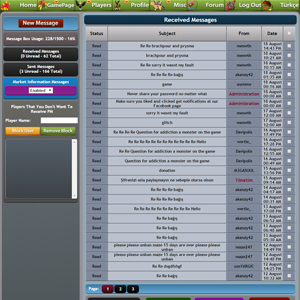 Clicking on the envelope icon will open the Message Box page, where you can send a private message to another player or view private messages from other players. 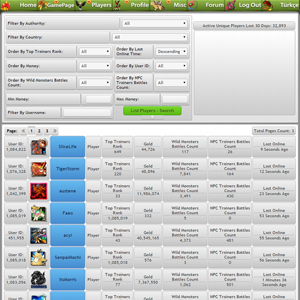 Your Message Box is constantly updated as you play. Whenever there is a new message in your inbox, a small red star will appear in the top right corner of the envelope icon so that you can tell at a glance whether you have new mail. 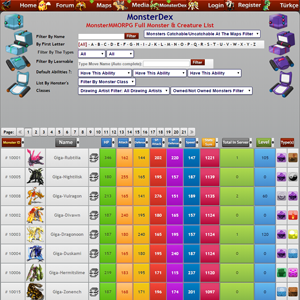 -> Held items that allow you to customize your monsters power. 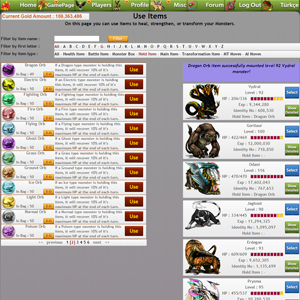 -> MT items that can teach new moves to your monsters. 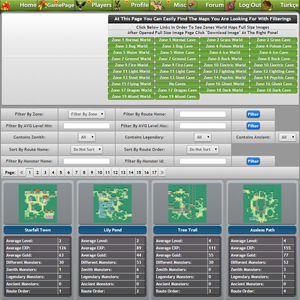 -> 3,000 different attack moves with varied effects and features that you can't find in Pokémon games. 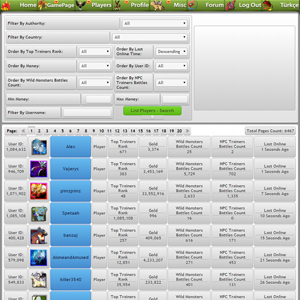 -> Challenge NPCs and search high and low for legendary monsters to keep the game interesting. 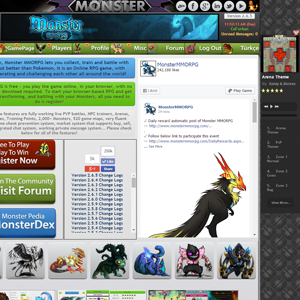 -> Full-featured Monster Dex, containing ALL the information on ALL of our monsters! -> AI moves that can be used to assist you out of battle. -> Monster locations change every update, giving you a new gameplay experience with each update. 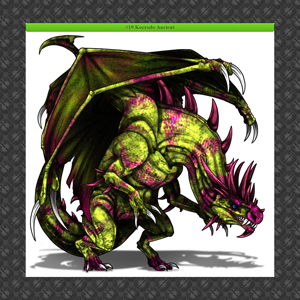 -> Use varied transformation methods to make your monsters more powerful. 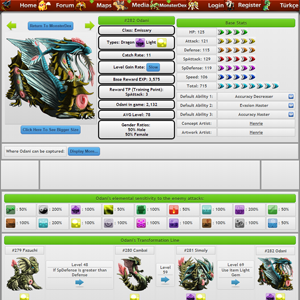 -> TP (Training Points) allow you to customize the growth of your creatures. 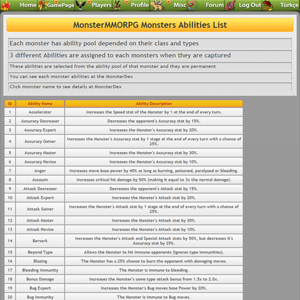 -> Lots of different types of monsters and tons of monster classes to capture and train. 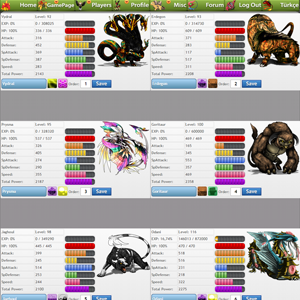 -> UV (Unique Values) determine the outcome of your monsters stats. 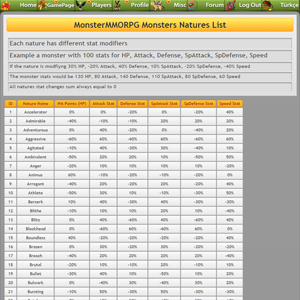 -> No two monsters the same with more than 100 different natures affecting stat growth. -> Single M.Sc. computer engineer (Furkan Gözükara) developer that has made the game development more stable, dependable and advanced. 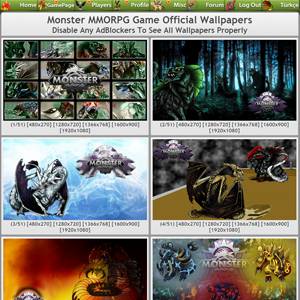 -> 520 detailed game maps, and more than 2,000 monsters to battle, capture and train! 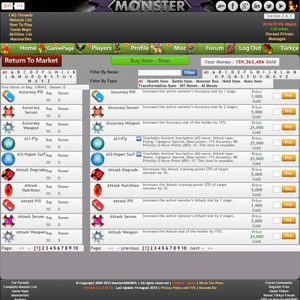 -> Fully functional trade system allows you to trade multiple monsters at a time, offer items and money in exchange, or give monsters to your friends. 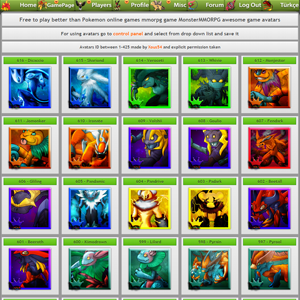 -> 20+ different starter monsters, each with 3 stages. 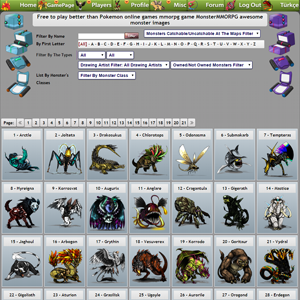 -> 7 different monster classes: starter, regular, superior, emissary, zenith, legendary, ancient - make the game more challenging. 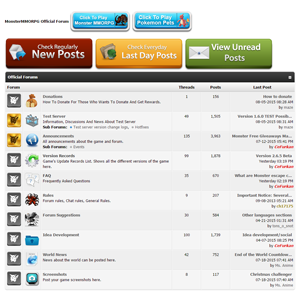 -> Over 3 years of development experience and solid game information safety, no accounts have been reset or lost. 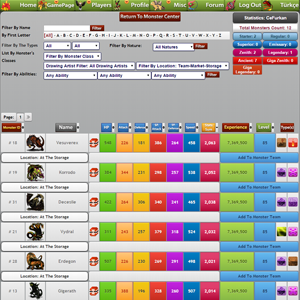 -> Advanced search system in every area of the game that allow players to quickly find whatever they are searching for, such as: filtering game maps by monster classes, ordering monsters at the monster dex by any wanted stat, or filtering on sale monsters on bazaar by any ability you want. 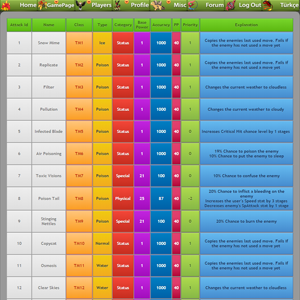 -> You can change your starter at any time. -> AI items that can teach stronger moves to you monsters.